In a small bowl, combine water, yeast, and some sugar. Let sit until foamy for approx. 5 – 10min. In a standing mixer or with a hand mixer, whisk together milk, vanilla extract, egg, melted butter, some sugar and a pinch of salt. In two editions, add all-purpose flour into the milk mixture. Then add in yeast mixture and continue beating. Knead by hand until smooth. Place the dough in a clean bowl, cover with a kitchen towel and leave it to rise in a warm place for approx. 2 hours. For the filling, combine soft butter with the remaining sugar, cinnamon and the zest of halve an orange in a small bowl. Mix until smooth. Preheat oven to 190⁰C/375⁰F. Halve the dough and roll each half into the shape of a rectangle, approx. 3 mm thick. Spread the filling evenly onto the dough leaving a small border all around. Starting at the long end, roll up the dough. Cut the roll crosswise into equally sized pieces. Place the rolls into the prepared muffin pan cut side down and leave to rise for another hour. Then bake in a preheated oven at 190⁰C/375⁰F for approx. 15 - 20 min. until golden. Allow to cool for 10 min. on a cake rack. In a small bowl, combine confectioner’s sugar and lemon juice. Stir until completely dissolved. Place a plate underneath the cake rack to catch any excess frosting. 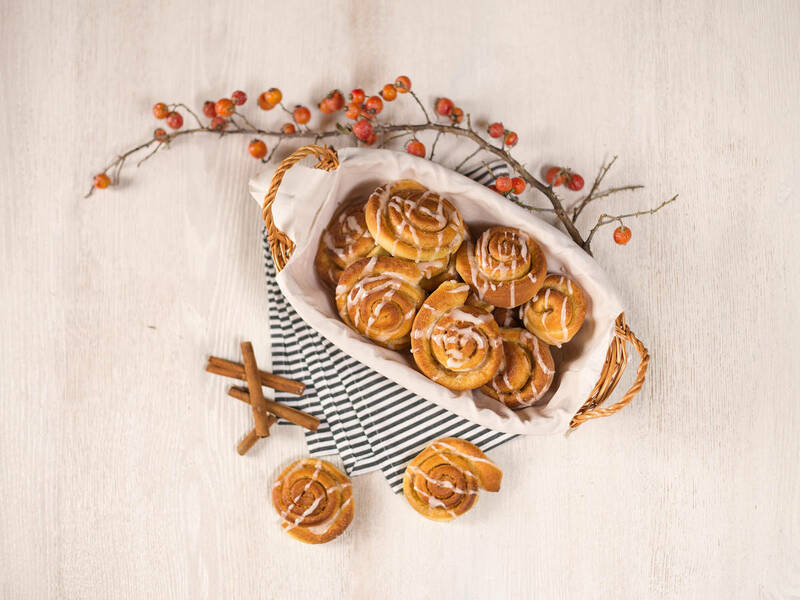 Drizzle cinnamon buns with sugar frosting to your liking. Serve while still warm.